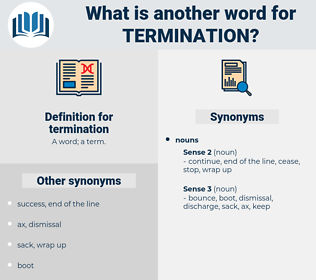 What is another word for termination? separation, Separations, discontinuance, extinction, discontinuation. dissolution, finalisation, separation, discontinuance, extinction, discontinuation. beginnings, sacks, terminated, cancellation, cancellations, expiry. Termini, abandonment, rejection, repudiation, halt, cancellation, eradication, end-of-service, renunciation, laying-off, disintegration, interrupt, disappearance, halting, break-up, exhaustion, nullification, winding-up, Revoking, quenching, forfeiture, exclusion, discharge, breakup, write-off, sunset, whistle-blowing, derogation, deprivation, condemnation, resolution, extirpation, complaint, expulsion, injunction, phase-out, firing, duration, expiry, collapse, deportation, release, failure. Ceased, discontinued, suspended, Revoked, fired, severed, Curtailed, attached, terminated. 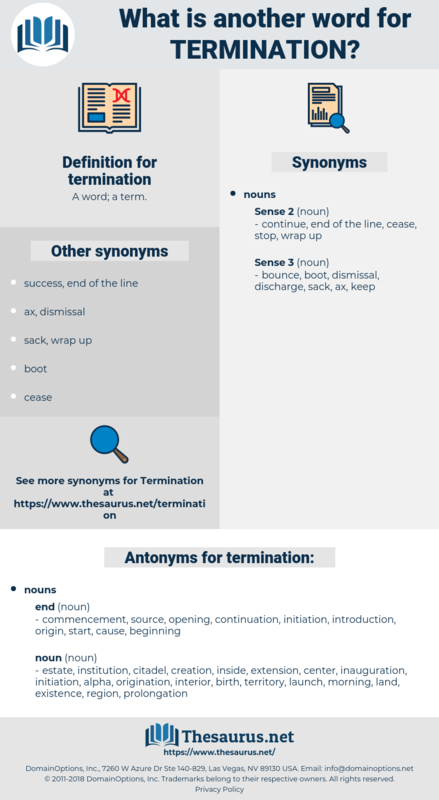 cessation, terminate, completion, dismissal, dismissals, denunciation, closure. abrogation, suspension, adjournment, disruption, disbandment, cessation, layoff, elimination, abortion, liquidation, abolishment, outage, retraction, completion, dismissal, break, stoppage, Lifting, Disbanding, Whistleblowing, rupture, blackout, breakdown, denunciation, order, closure, loss. commencement, source, opening, continuation, initiation, introduction, origin, start, cause, beginning. morning, region, prolongation, inside, institution, origination, alpha, existence, inauguration, launch, extension, citadel, birth, land, estate, creation, interior, territory, center. The termination of hostilities against England had relaxed the already feeble bonds connecting the States. The end may come quickly, or the patient may decline gradually toward the fatal termination.